Don't take a shower at the Bates Hotel! A mentally unbalanced man, Norman Bates, causes terror and murder at his motel, but is finally brought to justice. 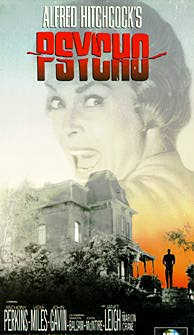 Psycho is considered Alfred Hitchcock's "masterpiece of the macabre," a most compelling and terrifying film. A horror/suspense masterpiece from director Alfred Hitchcock. He received a Oscar nomination for best directing. The cast includes: Anthony Perkins, Vera Miles John Gavin, Martin Balsam, John McIntire, and Janet Leigh.